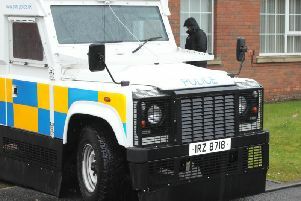 A major police and immigration operation is taking place in Lurgan this morning after serious allegations of human trafficking, slavery and illegal gangmaster activity. It is understood multiple organisations are involved including police, immigration and welfare officers. Eyewitnesses say unmarked vans as well as police cars arrived in Albert Street before 6am this morning, circling the street. It follows allegations recently that residents were concerned of ongoing criminal activity including human trafficking, slavery and illegal gangmaster activity. There were also concerns that some of the small terraced houses were crammed full of people living in inhumane conditions. Sinn Fein Councillor Keith Haughian welcomed the intervention by the PSNI and Immigration in Albert Street. Speaking as investigations were carried out Cllr Haughian said: “Today’s checks by immigration officers and PSNI should give peace of mind to local residents that anyone living in the area is there legally. “Importantly, it should also ensure that no one is being forced to live in inhumane conditions. “Allegations of human trafficking, slavery, criminal activity and large numbers of people being asked to live in unsafe conditions have to be examined and today’s actions will hopefully deal with such matters. “I would call on relevant agencies, including council, to follow this up with more work around building a strong cohesive community. “There is a serious responsibility on private landlords to ensure their tenants are safe and their houses aren’t being used irresponsibly.